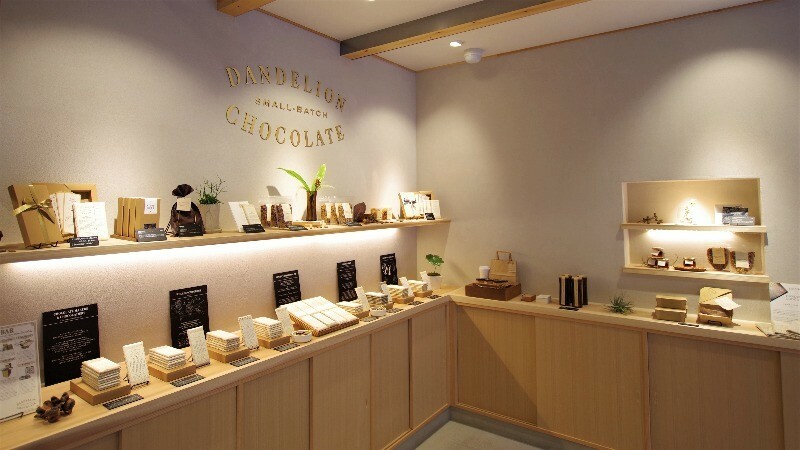 Close to Kodai-ji Temple, on the top of Ichinenzaka-hill, you can find the chocolate specialty shop Dandelion Chocolate Kyoto Higashiyama Ichinenzaka, a place that specializes in handmade bean-to-bar chocolate. This chocolate brand was founded in 2010 in San Francisco, and now they have shops in Tokyo in Kuramae, in front of Ise Grand Shrine in Mie Prefecture’s Ise, and Kanagawa Prefecture’s Kamakura. And on April 26, 2018, they opened their first shop in the Kansai area, in the atmospheric area of Ichinenzaka. The shop is designed carefully; there is a Japanese garden, the tables and chairs are wooden, and the atmosphere warm. On the back corner of the first floor, you can find a first for Dandelion Chocolate: a Cacao Bar. Bean to Bar Ice Cream is your chance to have a complete chocolate experience; you get to have three different ice cream flavors, one made using cocoa beans, one with cocoa nibs, and one with the finished product, chocolate. They also serve alcoholic drinks made with sake, rum, and others, so you can enjoy the pairing of drinks and chocolate, and the rich taste the drinks bring out in the ice cream. This shop offers chocolate cakes, and many things you can buy to go, so if you like chocolate, this shop is sure to be worth a pilgrimage. Made with cocoa beans from different countries, these brownies each taste different, so you get to enjoy both the brownie and differences in the taste of the chocolate. These brownies are moist and taste richly of chocolate – I can guarantee you’ll get addicted to them. From the left: Ecuador, Dominican, and Belize are the three locations from where the cocoa beans to make these brownies come from. Three types of ice cream made with three types of cocoa beans. The most left one is a sorbet made from cacao pulp. The cacao pulp has a slight sourness, the taste resembling lychee. It’s topped with lime-tasting merengue. The second one is an ice cream made with cocoa nibs and topped with a burnt butter madeleine. The right one is an ice cream made with Dominican chocolate, topped with sesame oil. I recommend starting from the left with the rather light tasting one and finishing with the rich chocolate ice cream. You also get a cocktail called “Husk Marriage” with the ice cream, made with rum from the Dominican Republic, Brugal Anejo, absinthe, pink pepper, and honey. The cocktail is served warm and goes perfectly with the ice cream. This is a nib bouchée cookie containing cocoa nibs in its bouchee style batter. The cocoa nibs give a nice texture to the buttercream filling made with egg yolks. This sweet dipped into chocolate is great for tea time! This rich hot chocolate is topped with a generous portion of sweet-but-not-too-sweet whipped cream, which contains cocoa nibs and makes the taste even better. This is something those who like chocolate will surely love. Their menu is in English and they even have plastic models of the sweets. They also sell chocolate made from beans from different parts of the world, hot chocolate, and other products made with chocolate, so this is a nice place to buy some souvenirs! It was my second time visiting this shop and I feel like there are no other chocolate shops in Kyoto that take chocolate this seriously. Especially the Cacao Bar was a completely new experience, where you could taste the full taste of single origin cacao desserts, beautifully paired with alcoholic drinks. This place let me, a person who normally just eats chocolate, also understand chocolate. 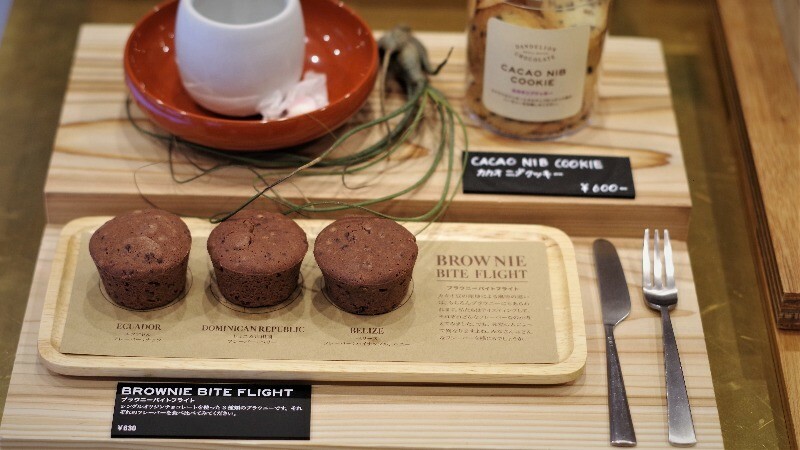 At this shop, you can enjoy the Cacao Bar (reservation recommended) and the café. At the Cacao Bar, you can enjoy desserts that let you enjoy the whole cacao bean, even the cacao nibs that are removed from the shell of the bean, and the cacao pulp, and the pairing of these with cocktails! They also have nonalcoholic cocktails (or mocktails), so you can still enjoy the bar even if you don’t drink, The chef makes the desserts and drinks right in front of you, so this will become a great memory of your trip! In the spacious café that has a tall ceiling, you can leisurely enjoy sweets made with chocolate from different parts of the world. Even if you think you already know chocolate, you can make new discoveries here, so if you like chocolate, please pay this shop a visit! Your view of chocolate may change! A 5-minute walk from Kiyomizu-michi bus stop. This place is located in a popular sightseeing area; they have an English menu, and even food samples, so ordering is easy.